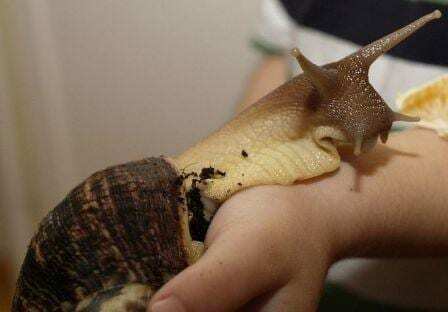 1) The giant African snail is an, African, species of, snail, that is, giant. As in compared to other snails, not in an Eight Legged Freaks or a Them way. Their foot reaches up to 20 cm in length. Unfortunately for everybody involved, it was less-than-accidentally introduced all over the place and is currently, subsequently classified as one of the most invasive species in the WORLD. Duh duh DUUUH. 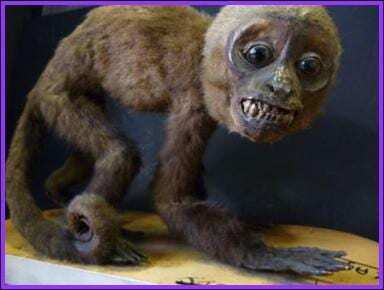 The impressive sounding Global Invasive Species Database lists it within the 100 World’s Worst Invasive Alien Species”. Such notoriety gives it a certain Hollywood-villain flare that I find attractive. 2) Why were they introduced? Many reasons; in some countries they were introduced as food, in others they just hitched a ride in produce. In the UK, the main problem seems to be from people freeing their pets, perhaps suddenly realising that their 60 year life span is too much of a commitment. Whatever the mechanism, the main issues are that they are hermaphrodites, so they don’t need to find a girlfriend or a boyfriend, just A friend (they cannot reproduce alone), and they reproduce exponentially. So once they get going, it’s difficult and costly to stop them. 3) This pestiferous (real word) species has a red-brown shell with paler stripes, though the colouration is apparently affected by environmental conditions. A full grown adult’s shell has between seven and nine whorls and can be short short and broad, or long and slender. 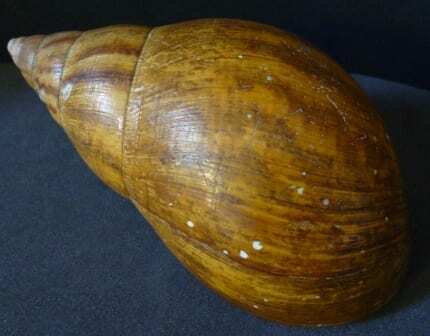 4) In its native environment of eastern Africa, the giant African snail is found at high and low elevations and utilises a number of habitats from plantations and gardens to both primary and secondary forests. It also thrives in agricultural areas, loves a good stream or river, and will even consider urban developments. This versatility is one of the reasons it has been so successful at world-conquering. 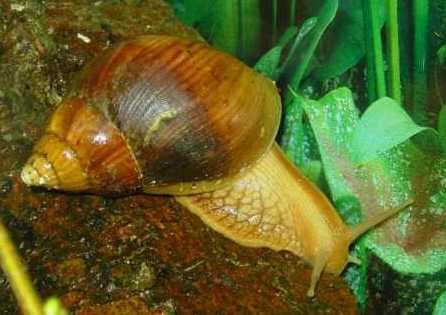 5) An individual giant African snail will lay eggs five or six times each year in a damp area of vegetation. They lay around 200 eggs per go and furthermore, about 90% of these eggs will hatch, which just goes to show how reproductively prolific they are. That’s a lot of children. The teeny eggs grow to adult size within just four months, at which point, they can start laying eggs of their own. 6) Although not well researched, I thought you’d like to know about the very definite presence of personality within giant African snails. I didn’t mean to get pets, I was in a pet shop (for someone else…) and saw two small snails in an empty tupperware box. Not the most natural of habitats. The owner of the shop was dismissive of their shop-worthiness in such a way that I felt compelled to foster them. As they grew (and grow they do) Jaws became the outgoing, vivacious one that would be first to the dinner table, first to try and break out of their aquarium every night and would regularly try and engage in snaily-shenanigans with the less than impressed Basil. Basil on the other hand, perhaps shy about his malformed shell (I blame a rough childhood) was very docile, afraid of everything– would retract at the slightest hint of a noise, and didn’t enjoy the same variety of hobbies as Jaws. He didn’t care much for escape attempts and barely gave it much of an effort. I could go on, but I think I made my point.